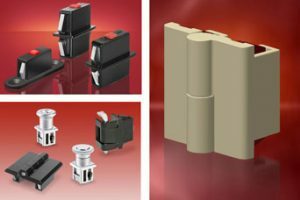 Snap-line fasteners and joiners featuring the innovative D-Snap® technology enable quick construction of custom enclosures for specialist panel builders. Their snap together system enables steel panels to be manufactured and simply clipped together when needed to provide a robust housing without the use of tools or mounting hardware. Non standard sizes and complex shaped steel housings can be produced for many industrial purposes including electrical equipment and for supermarket displays. *A free pocket guide to D-Snap is available; see our “Books” section. Share the post "Build your own custom enclosure with Snap-line fasteners and joiners"
Previous post: Handles – we’ve got lots of lovely handles!